* Dimensions: Height 15" x 27"
* Two Chamber System,two identically sized cylinders are filled and emptied in alternating cycles. *12' The Built-in Wheels allow for easy movement and transportation. 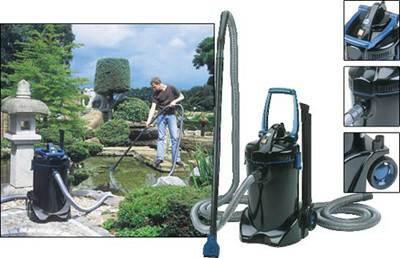 *EXCELLENT FOR REMOVING STRING ALGAE FROM YOUR POND PLUS LEAVES, DEBRIS AND DIRT. ALSO USE OUTSIDE THE POND TOO .